Ollie Robinson has been named Sussex's County Championship player of the season. The paceman - who actually ended the draw with Warwickshire bowling spin - has got through a marathon 452 overs this season, the most by any fast bowler in the competition, and has taken 67 wickets. His form has had some talking of an England chance. 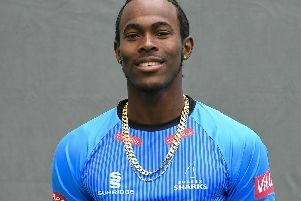 He was named the county's four-day player of the season when the awards were dished out in front of supporters at the end of the draw with Warwickshire which confirmed the midlands side's promotion and meant Sussex would be back in division two next season. Laurie Evans picked up the award for the one-day player of the year after his batting heroics in the Vitality Blast and One Day Cup. Phil Salt won two awards - performance of the season for his 148 which set up a championship win over Derbyshire, and young player of the season. And there was a team man of the year award for spinner Will Beer, who has had to be very patient waiting for a first XI spot but has bowled superbly when called upon. Head coach Jason Gillespie said all the award winners deserved their accolades in a season when the spirit in the camp had been excellent. Robinson is due to have surgery on a hip problem once the season ends.